On 26th October 2018 Management watch activity titled “The News Hour” took place. Students of IPER delivered a good display of smart work by creating a Real- Life newsroom. 2 Newsreader and 2 correspondents fetched them appreciation from the audience. On the other hand, the second round led to the remarkable and a well-deserved standing ovation performance where students created a real-life newsroom with reporters and correspondents. Making effective use of powerpoint presentation to portray live locations. The unique and appreciative part of the news was- ‘IPER Exclusives’. News from the IPER campus highlighting the activities undertaken by the Institute for the overall development of the students. The third and fourth segment consisted of company briefing and video presentation respectively. The students gave an outstanding presentation on Tata Group commemorating 150 years of the company. Listing the area TATA group works in along with financial data analysis of the company’s financial and business performance. The activity helped students to have a detailed insight into TATA group’s working and career opportunities available for MBA graduates. Lastly, preparation of a Melodrama video, showcasing corporate responsibility towards differently-abled citizen took place. 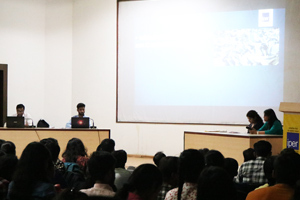 Presentation done by the students on how corporate work for the upliftment of differently-abled groups. Moreover, students also visited a Bhopal based NGO – “Arushi”- a society for the welfare of special children and had an interactive session with the kids. The activity instilled team-spirit, leadership, sensitivity and technical skills among students. It is a pre-requisite of an efficient manager. Also, some participants worked hard on designing the e-newspaper. Repetition of this activity shall take place every fortnightly, displaying significant news via role play and inform students about leading business houses.